This slot release from Quickspin is all about the future, with modern elements reflected both in the grid’s outward appearance and underlying features. Immersing players into the story of three tech genius children destined to build the world of tomorrow with all its high-end programs and robotic machinery, the Big Bot Crew slot will introduce you to their main invention – the big red robot Bigbot. Aside from Bigbot, which acts as the Wild symbol on the Big Bot Crew reels, players can benefit from a range of other symbols during the base game, starting with low-paying robotic parts, through to higher-value symbols representing the child characters and additional robots. 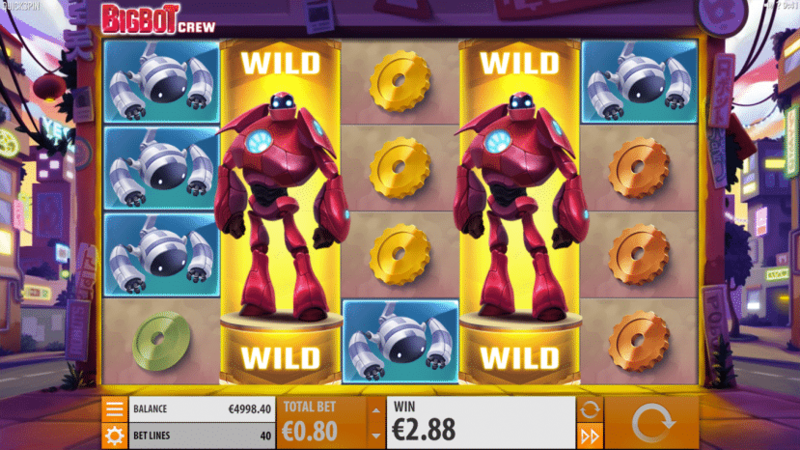 In this regard, the Bigbot Wild offers the best payout potential during the base, as it can trigger the Bigbot respins or the Mystery Nudge feature. Two or more Bigbot Wilds landing on the reels will trigger the same number of respins from the Bigbot respin feature, with the symbols remaining on the reels for the duration of these spins. The Mystery Nudge feature, however, is triggered either when two or more Bitbots land on the reels and activate the respin, or during the respin – what it does is nudge any partial Bigbot Wild to cover the reel fully, awarding one more respin. For the bonus round, players will need to land three Bonus Scatter symbols anywhere on the reels, represented by a lamp. This gives players 8 free spins, but any Bigbot Wild landing fully on the reels during the freebies will award +1 free spin. Partial Bigbot Wilds always nudge during the bonus round, and act the same as just described once they fully cover their reel. These Bigbot Wilds landing during the free spins bonus round remain on the reels to the end, triggering additional payouts, with the highest one being the Epic Win. Players that hit this payout during the free spins will win 100x+ their bet amount. The Big Bot Crew slot evidently offers great payout possibilities across its 5-reel, 4-row grid benefiting players with 40 fixed paylines. All they have to do is set their bet size, ranging from as low as €0.2 to €100 per spin and hope to hit the maximum payout of 5000x their bet. With such prizes, living in this parallel high-tech universe doesn’t seem so bad after all. Big Bot Crew video slot has been released on the 11th of September 2018! 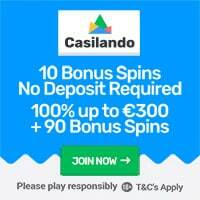 Featured: Get $€21 No Deposit Casino Bonus at 21 Casino! « Super Hot Casino Bonuses Available Now!